One of our most popular feature requests has been the ability to assign tasks to team members and manage the approval workflow from within Sendible. We’re excited to announce that this feature is now available on all of our multi-user plans! Team administrators can now specify exactly which user needs to approve content before it gets published. 2. Go to My Users and either create a new user or edit an existing one. 3. You will now see an Approval Worfklow section. Click edit to define who this user needs approval from before they can publish content. 4. Follow the steps to Save or Create the user. 5. Now, when this user creates their content from the Message Box, they will see a Submit For Approval button. 6. 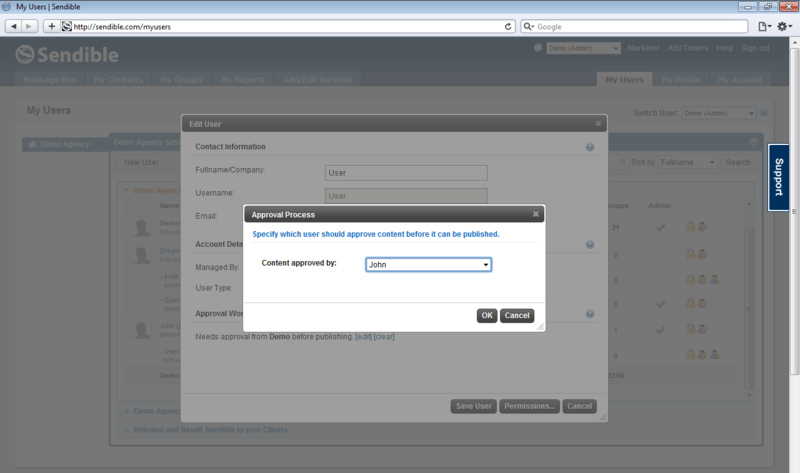 The user has the ability to add a message/comment that will be sent to the user from whom they require approval. This user will receive a notification, informing them that they need to either approve or reject the content.